The Black Pearls Football Club arrives at the end of 2017 closer to the dream of becoming a global team of refugees. In addition to winning the Rio State Championship C Series, which moved the team up one rank in the competition, and the efforts to expand the project to the Middle East, a move that the board hopes to achieve in 2018, the club has just hired Venezuelan Juan Andrés Rodriguez Collado, 18, who will stay for at least two seasons playing for the Black Pearls Under-20 team. He will live and study with his teammates in Paty do Alferes, a city in the south of the state of Rio that houses the club’s headquarters. Juan was already an athlete in Venezuela and even played for the Under-15 National Team and for Carabobo FC, a first division club in Venezuela. 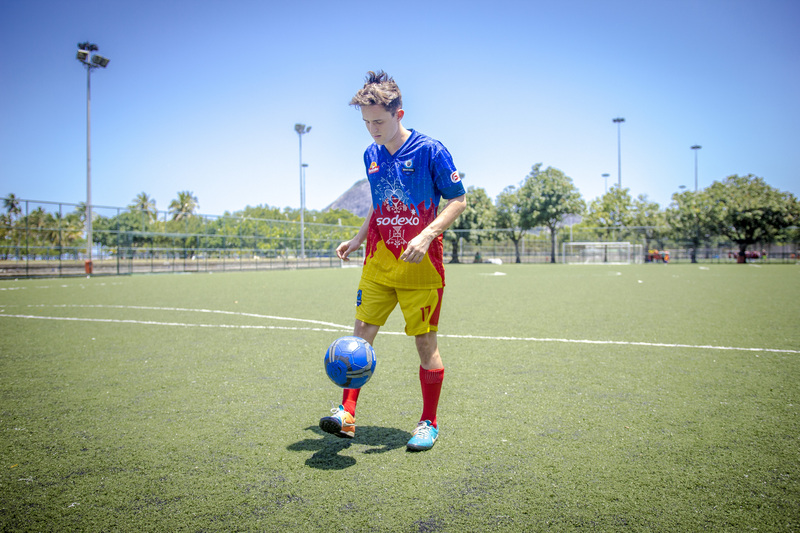 Since he arrived in Rio one year ago, Juan has been seeking an opportunity in the local football scene while maintaining routine training at the fields in Aterro do Flamengo. “I always heard of Brazil as a global elite in football. There are a lot of good people here. I felt the difference when I arrived, I could see that I tired long before the Brazilians. But I believe in myself and now I will prepare and give my best for the Black Pearls”, says Juan. “We left Venezuela for political reasons, including death threats. I was impressed by the recent events in my country, with the death of more than 100 young people in protests. Thank God we were able to get ourselves established here in Brazil, because it could have been my son, he would have been on the streets with his friends protesting too”, says José. To first enroll in Rio’s State Championship with Haitian athletes, the Black Pearls achieved to change the regulation that stipulated limits to the participation of foreigners in the competition. The club won a lawsuit with the Rio Football Federation so the refugees are no longer considered foreigners. The Black Pearls embraces the mission of helping refugee athletes to show their worth to the world. Stories like Luka Modric’s, who began his career with refugee status and was just chosen the best player in the FIFA Club World Cup, reinforce the certainty that refugee camps and shelters are filled with precious talents waiting for an opportunity. Juan’s hiring is the first step of the Black Pearls beyond the Brazil-Haiti connection, and his arrival is expected to be the first of many that will make the Black Pearls a world-wide team of refugees. The Black Pearls FC was created by Viva Rio in Haiti to generate social impact. Learn more about the project here. Posted in Notícias and tagged Educação e Oportunidade, Futebol, Haiti, Pérolas Negras, Série C.